In the aftermath of the destruction of Romulus and Remus, you will rise from the ashes to fight for your freedom and people! Equipped with all of the items the Legacy Pack has to offer, the Tal Shiar stands no chance of getting in your way. Are you ready to build your legacy? The famed Dderidex is upgraded with a Projected Singularity console that allows you to channel your Singularity Core into a mobile rip in the space-time continuum. Unlocks at Tier 5 (Vice Admiral). The Mogai Class, as seen in Star Trek: Nemesis, is upgraded with an Ionized Particle Beam console. It empowers all of your energy weapons with a negative Ion charge which can expose enemies to a powerful Ionized Particle Stream generated by your ship. Unlocks at Tier 5 (Vice Admiral). The Dhelan Warbird is upgraded with a Sabotage Probe console that will penetrate an enemys shields, attach to their hull and siphon off weapons power until it takes their weapons offline. Unlocks at Tier 5 (Vice Admiral). The great look of the 2150s-era Warbird with power for the 25th century. Includes a Plasma Destabilizer console that launches a slow moving but devastating Destabilized Plasma Torpedo that deals extreme kinetic damage and heavy plasma damage over time. Unlocks at Tier 5 (Vice Admiral). Light, fast and maneuverable, this ship includes a Singularity Stabilizer console that will bring an offline Singularity back online and provide a gradual boost to Singularity power. This is a starting level ship and unlocks at Tier 1. Made famous in Star Trek: Nemesis, the Scorpion fighter is fast, maneuverable, and has a small, highly efficient Singularity Warp Core capable of using the Singularity Overload ability to fire a devastating barrage of attacks. Play as a Reman and fight for the freedom of your people! - This includes new Reman themed costumes that will be unlocked throughout your progression! - Owning the Reman playable species will unlock two Reman ship materials which are usable on all Romulan ships you own. - Playable Remans may only be created as a member of the Romulan Republic. This Bridge Officer unlocks for all Romulan Republic characters on an account. It also includes two additional Bridge Officer slots! Add Reman Duty Officers with special traits to your crew. Unlocks only once per Romulan Republic character on an account. Open any lock box to get the treasure inside! *Unlocks only once per account on a character of your choosing. Keys are account bound and delivered in a reward pack. A unique uniform inspired by The Original Series. 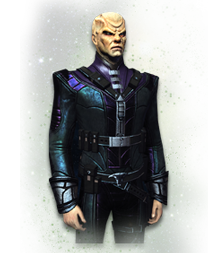 This costume unlocks for all Romulan Republic characters on an account. A unique uniform inspired by the Remans of Star Trek: Nemesis. This title is exclusive to purchasers of the Legacy Pack. It unlocks for all Romulan Republic characters on an account. It also can be used on the forums! This title is exclusive to purchasers of the Legacy of Romulus Starter Pack or Legacy Pack. It unlocks for all Romulan Republic characters on an account. It also can be used on the forums! Have more questions about the Legacy Pack? Check out our FAQ here.